A sharp restaurant/pub just a couple blocks from the University area. There are 14 taps - including many from Starr Hill. What a fantastic beer place! Beer run is a cafe, coffee house, gourmet beer bar and retail beer and wine store all rolled into one delightful experience. Owners John Woodriff and Josh Hunt do an amazing job here. The above photo was taken on Halloween night. A personable, locals pub located near the old court house. The pub features food and 18 decent drafts. The above photo shows bartender Liz Horan and owner/chef Luther Fedora of the delightful Horse & Hound. Luther has spent a lot of time in the UK and brings a really pleasant UK-style pub to the city of Charlottesville. 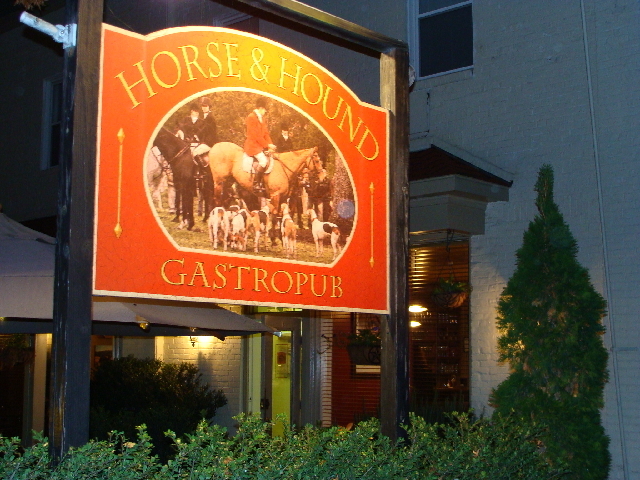 Horse & Hound offers innovative food, a relaxed atmosphere, and some rare beers on draft. An upstairs pub near the University featuring ten taps, a wide range of nice bottled beers, and good quality food items. Unfortunately, smoking is still allowed in the bar area and the smoke tends to drift over to the dining side of the place. A fun brewpub located several blocks from the University area, South Street offered Brewery Pale Ale, Hefeweizen, Porter, Anniversary Ale, Satan's Pony, Absolution Ale and Liberation Lager the night we visited. Their wall mural (shown above) is quite impressive.